TODAY: 108 Adams Ave. home of Christine Petersen built c. 1913. 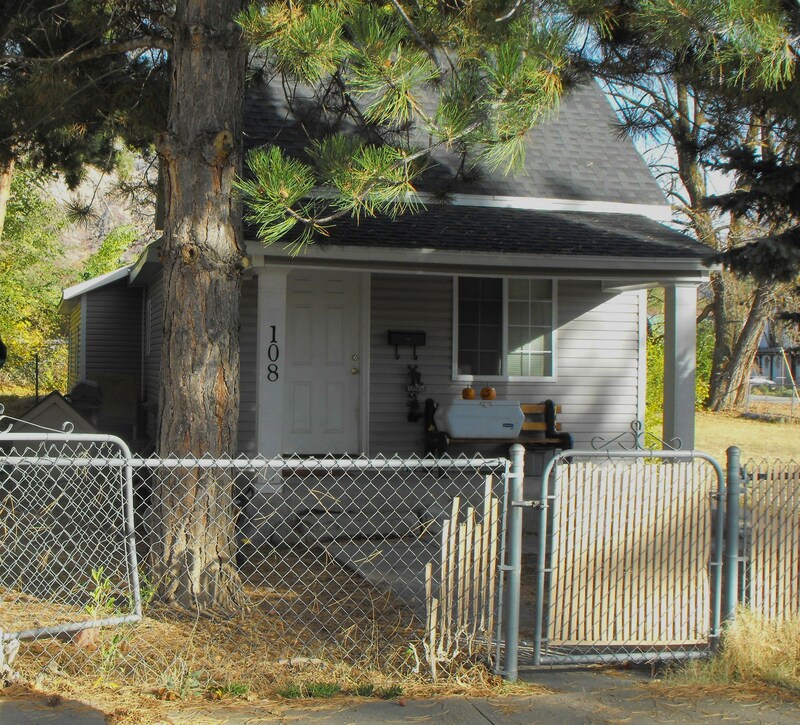 This house is representative of many houses on the east side of Lynne built by Scandinavian immigrants from 1880 to about 1910. 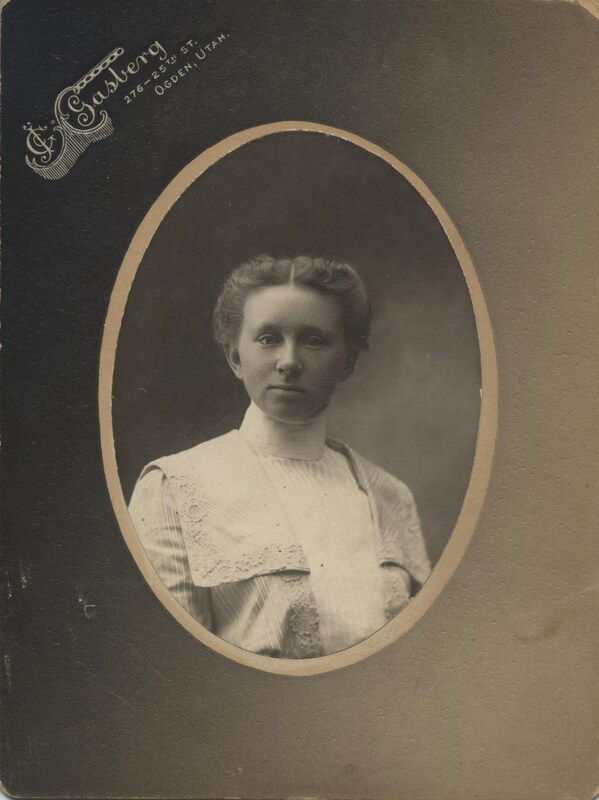 Christine Petersen, c. 1900; photo courtesy Cody Nixon. 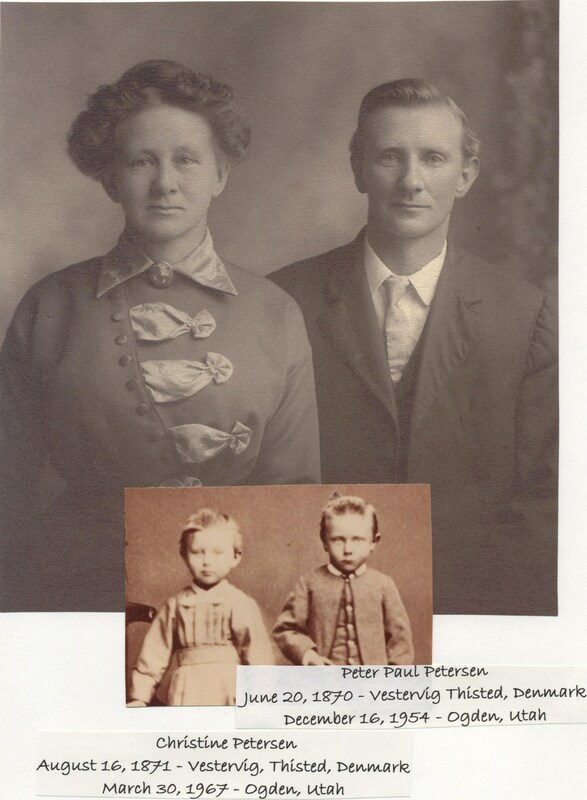 CHRISTINE PETERSEN, DANISH IMMIGRANT Christine’s father, Paul Petersen, was born in Denmark in 1830, married Fredericka Lousia Christensen, and had two children, Christine and Peter. 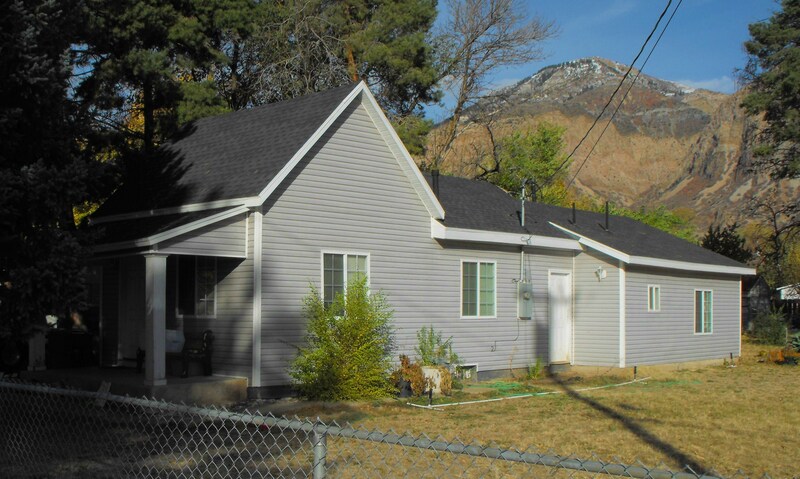 In 1879 the family immigrated to Utah Territory, to Ogden municipal ward 4 or Lynne, which was next to Harrisville where Louisa’s brothers were already living. Christine was 8 years old. There was an expanding population of immigrants from Scandinavia living on the east side of Lynne to welcome the Petersen family. Peter Sherner served as president of the Scandinavian Society. Fredrika Petersen & Paul Petersen; photo courtesy Cody Nixon. 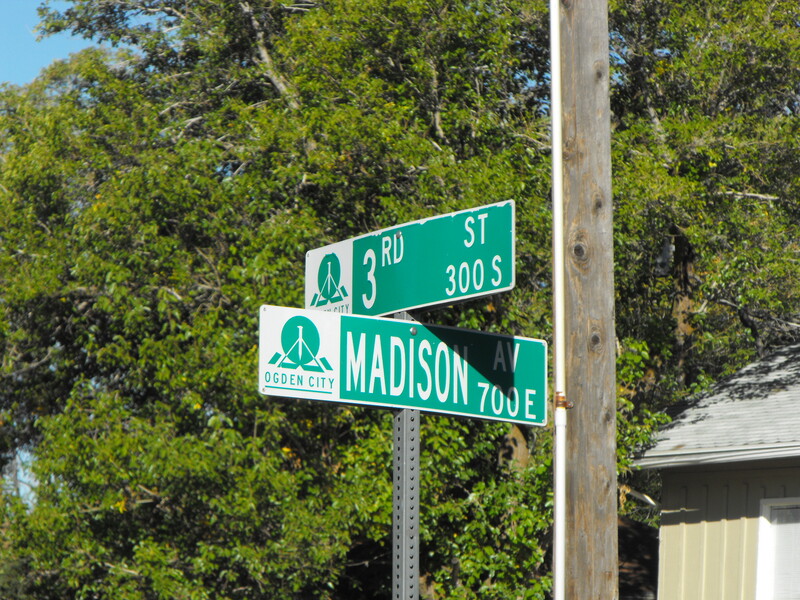 At first Christine’s father worked as a laborer in the brake yard, and in time he established a dairy/ fruit farm at today’s address of Madison and 3rd Street on the brow of the hill east of Five Points. The Petersens accessed their farm from 2nd Street on lanes that stretched from 2nd to 7th Street above the canals. In 1889 Ogden City annexed Lynne and laid out a subdivision called East Lynne between Adams Ave. and the hill that led up to the bench (see map). In about 1900 Ogden City bridged the canals on 3rd Street, and then the Petersen family could then access their farm from 3rd Street. 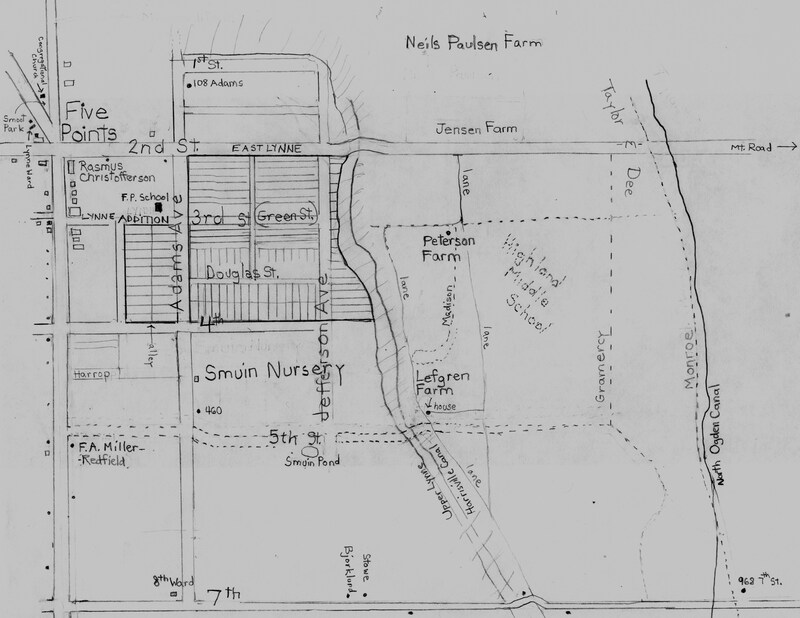 YESTERDAY: Petersen farm above the canals at today’s Madison Ave. & 3rd St.; Christine’s house 108 Adams Ave. 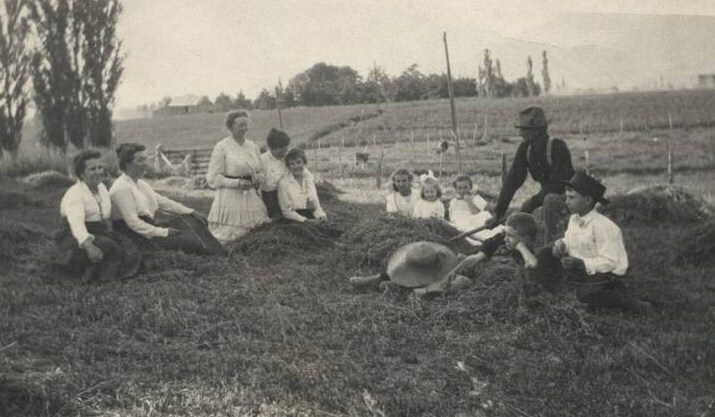 YESTERDAY: Petersen Farm at Madison and 3rd St. – L to R: Grandma Burnhope, Peter’s wife Mary Ann Burnhope, Peter’s sister Christine Petersen, two friends, Peter’s daughter Helen, a friend, Peter’s daughter Thelma, Peter Petersen, his son Frank, and a friend; photo circa 1910, courtesy Chris Petersen. Christine’s mother died in 1885. Her brother, Peter, married Mary Ann Burnhope in 1897. Christina lived on the farm with her father and later cared for her father until his death in 1911. 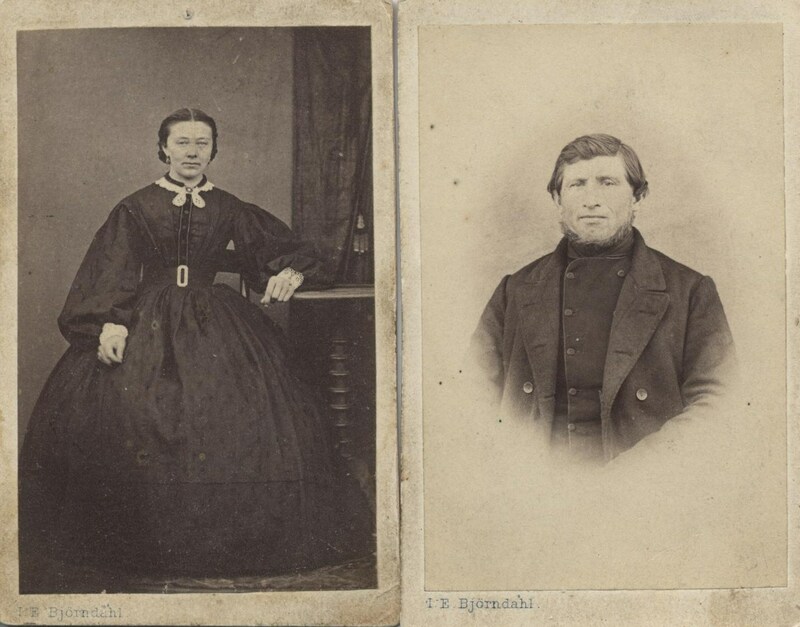 She did not marry but worked as a caterer for weddings and parties and was employed at the old military academy and then at the Utah Industrial School. In about 1913 she moved into her own house at 108 Adams Ave. and lived there until the early 1960s. All her life she remained close to her brother. She was a member of the Five Points Congregational Church. In 1967 she died in an Ogden rest home at the age of 95. Christine Petersen and her brother, Peter Petersen; photo courtesy Cody Nixon. Family records; census records; R.L.Polk & Co.’s Ogden City Directories. Obituary of Christine Petersen; R L Polk & Co.’s Ogden City Directories.